It's a toss up whether Kalapana or Punalu'u is Big Island's most famous black sand beach. Certainly Punalu'u is the most striking, with its dark sands suddenly stopping at the edge of a bright green forest. 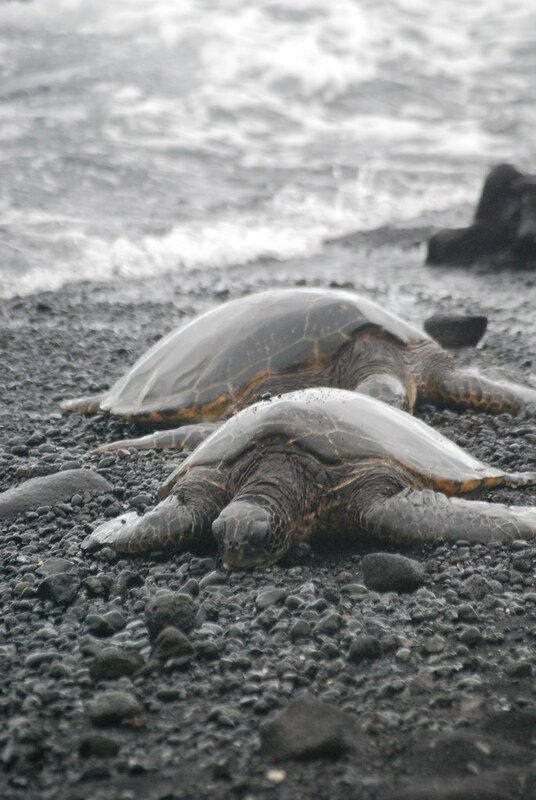 It's also one of the best places to see honu, as the green turtles haul themselves up the beach to bask in the sun, after feeding for algae in the wild surf. There's a sign in the middle of the beach, advising you to keep well away from the turtles. That's where you'll find them. The afternoon we stopped at Punalu'u there were two on the sand, still wet from the waves, glistening against the black sand and crumbled lava flows. I kept well back, and cranked my camera up to maximum zoom. Luckily I managed to avoid getting an illiterate family in shot, who had to be hauled back from the shy beasts. I'm particularly pleased with this shot. They look so completely and utterly operationally-inept when on land. Truth is, some critters are just not equipped to be amphibians. To the turtles I'd add walruses, seals, sealions... please, you guys - retain your dignity and just stay in the water! That? Is one terrific photograph.